Green Spaces… has an old, artistic, warehouse charm, and like the name says, it’s all about being green, yada yada yada, but this was a upper 80 degrees humid summer night, and there was no air conditioning, just old fans, but being a Supper Club night, I guess we were willing to endure it, after all, we did Paypal $28 a head in advance. Rabbit Mafia works with socially conscious companies and uses local ingredients. All of their Supper Club dinners have been raw foods so far. This time, they partnered with Sea2Table (fresh, wild fish) and 44 North Vodka (distilled with Idaho potatoes), both of the guys who started the companies were there to savour the meal with us. 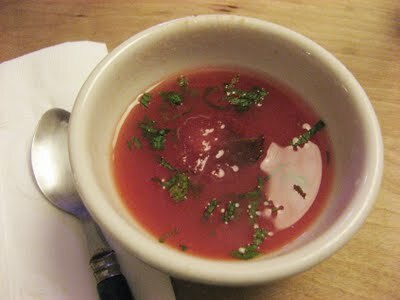 The 3 course raw dinner started off with a Chilled Summer Watermelon Mint Soup. This was just so so, it didn’t shout watermelon, and the flavors were confusing to me, not really tart, sweet, salty, just a weird mixture, what saved it though, was the watermelon ice cubes, sweet and refreshing. Main Course was the Wild Seafood Ceviche, Alaskan scallops, rock fish, Louisiana white shrimp with a side of wild Alaskan Coho salmon and pickled sea vegetables. The seafood was undoubtedly fresh, and the pickled sea veggies gave a good crunch. I usually like my ceviche with more acidity, but I enjoyed the sweetness this one had, mostly brought out by the summer corn and the slices of grapefruit and orange. I finished my whole plate, but was too shy to ask for seconds, specially since the portions were quite generous. My only complaint, it could have been a bit more chilled, but then again, there was no air conditioning, so I might be asking for too much. Tasty dessert of Fresh Fruit Raw Pie, totally a first for me, was my favorite course of the night. The creation of Sweet Potatoe’s chef Suzanne Barr. 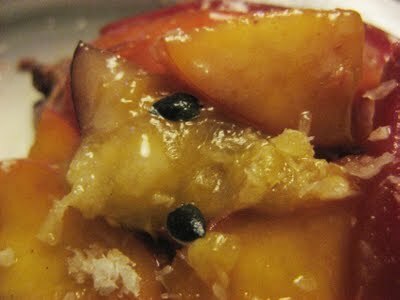 Topped with fresh plums, peach, star fruit, passion fruit and shredded coconut on top of a raw praline crust, with a side of Ginger sorbet. My palate was awaken by the passion fruit, I’ve only had passion fruit flavored sweets, but never the actual fruit, which was a bit slimy and the seeds were crunchy, very weird texture, but an explosion of flavor in my mouth. The rest of the fruit was fresh and swimming in syrup. This all sounds very healthy, but the chef herself was the first to admit that raw doesn’t necessarily mean healthy or low fat, but no one was counting calories, and the raw praline crust was the best thing ever. It had a mixture pecans, dates and other goodies all combined and shaped into a thin layer, really excellent. The Ginger sorbet had good flavor, but due to the oven like temperate, it melted!? what? yep, it melted, so we had soupy instead. We’re no doubt more forgiving when it comes to attending these events, heat, melt down, we took it all with a smile, specially when the chefs came by to chat about the dishes. 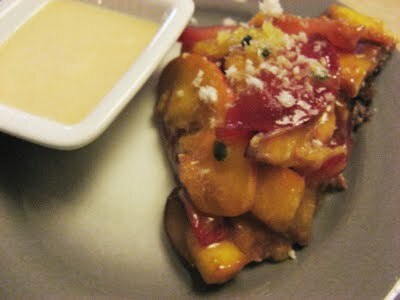 Overall the food was good and I had a fun first experience, I’m looking forward to my second supper club. I was reading quickly, looking at the pictures, thinking how good it all looked and I skipped right over what kind of dinner it was. Raw food can be awesome, but it was worrying that there was no air conditioning and you thought the ceviche wasn't cold enough. How do you feel today? 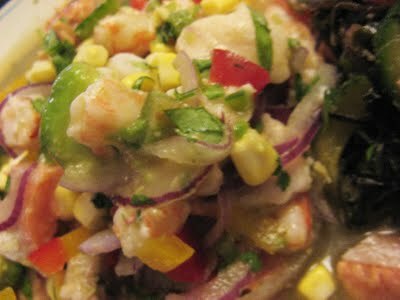 The ceviche DID look fantastic. glad you could make it! raw praline crust was my favorite too.